On Monday House and Senate Republicans announced a new Regulatory Reform Joint Subcommittee. Its focus will be streamlining and updating rules and regulations of state boards that issue licenses. The goal is to make our state government more efficient and to lift unnecessary burdens from business owners. I have included a news story on this topic at the end of my comments. At the start of the legislative session in January, We spearheaded a much-needed unemployment insurance tax cut for Idaho's employers. Without the cut, employers' taxes would have gone up. The governor has signed the bill into law. 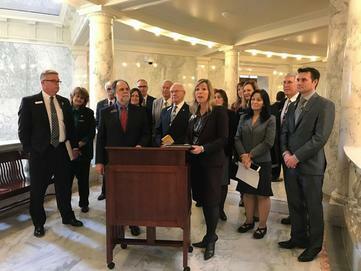 More tax items are on the agenda: As a result of changes at the federal level, particularly the Trump/Republican tax cuts, Idaho will update its own tax code. We favor reducing your taxes, while there are naturally some differences of opinion. In fact, Idaho is able to lower the tax burden on citizens and still deliver necessary services because we know how to run an efficient, effective government. More than a dozen GOP lawmakers, including two senators, held a news conference today in the Capitol to announce that they’re forming a “Regulatory Reform Joint Subcommittee” to examine the rules and regulations of state licensing boards and look for ways to streamline them. 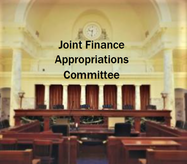 The panel, to be co-chaired by Rep. Gayann DeMordaunt, R-Eagle, and Sen. Todd Lakey, R-Nampa, will be a subcommittee of the House Business Committee and the Senate Commerce Committee. The amazing economy continues to be of interest and some concern. We had additional revenues in January with the assumption that taxpayers were paying their 2017 taxes ahead and would be needing a refund in April. This scenario is still happening. Again, January tax returns exceeded the estimation by about 88 million. The assumption is still that the taxes are being prepaid because of the changes coming from the federal taxes. Along with that, the refunds in April could wipe out the overage. What the cause may be is still not clear, there is room for caution as we try to set the next 18 months spending plan. The activity here is beginning to build. The long-expected tax “cut” bill hit the house floor on Wednesday. The benefit of the federal tax change was included in the 200 million in tax adjustments. That old adage about the devil being in the details works very well for this activity. We still do not know the extent of the federal tax adjustment, and our tax cut effort is receiving very different reviews as to the effectiveness. I suppose only time will tell. It has not passed both houses at this reading. We finish the budget hearings the first of next week with the next step, funding decisions. Each year, we come back to a problem that we did not address or did not have last session. The State Library is going to lose the funding or most of it for the Reading Books Service for those with impaired vision. The governor did not include this funding in his recommendation, however, the committee feels there is great value in this service, so the effort has begun to fill this gap. One of the budgets with very successful activity comes from the Department of Lands. Timber prices are good, we had less forest fires, and the cooperative effort with the federal neighbors (whose land is just next door) is paying off in healthy forests. We have 2.4 million acres of state endowment land. There are nine beneficiaries who receive the assets with public schools being the main one. The funds from grazing permits, minerals, timber, and cottage sites sales brought 78.2 million to share in 2019. The average annual returns have been 6.3 percent investment. One of the lesser known programs is for payments from the endowment fund is the School Bond program which can reduce interest rates on general obligation bonds for school districts. Our week of budget hearings ended on several more sober notes. We have been able to have the money to better fund our schools this past several years. Along with a healthy economy, we have had a very flat prison population, and very slow Medicaid growth. The report from corrections is exploding population with a request for a larger budget. The other troubling increase in budgets is with those who need extra help from the state, children, elderly, blind and disabled. This could be more cases or the medical cost much more. I don’t have an answer at this time for the cost of the need to lock some folks up, however, a bill from the Department of Insurance and Department of Welfare has been passed in committee. Should that bill clear the entire process, it will give us an opportunity to seek some waivers and place some of the very ill in our society on Medicaid. More about that later. 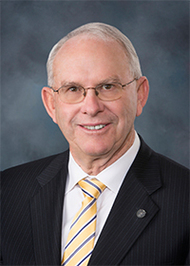 This week the House passed HB 463, making substantial changes to Idaho’s Tax Code. The potential effect of federal tax reform for Idaho in HB 463 includes provisions that will impact Idaho taxpayers in both 2017 and 2018. 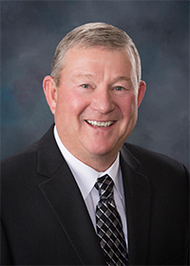 Those provisions will require careful consideration by the 2018 Idaho Legislature to determine the effect on Idaho taxpayers. One incentive for reducing taxes this year is to offset the increase in revenue that conformity – aligning our state tax code with recent federal changes – will bring. If Idaho chooses to conform, the state will collect additional revenue in the range of $82 million to $97.4 million. This means that some Idahoans – particularly those with multiple children - will pay more in state taxes. · Conform the Idaho income tax code to changes made to the Internal Revenue Code that affect the 2018 taxable year. The major provisions include: increasing the standard deduction and eliminating the personal and dependent exemptions. These and most other Internal Revenue Code changes are temporary and will expire or phase-out after 2025 unless Congress acts. · Reduce the individual income tax rates for all brackets by a .475 of a percentage point. · Reduce the corporate tax rate by .475 of a percentage point. · Create a nonrefundable state child tax credit of $130 per child. 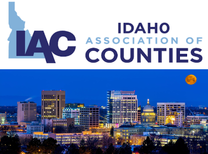 This week the Association of Idaho Counties (IAC) had their winter meeting. I had good visits with officials from Jerome and Twin Falls Counties. One issue of interest was overcrowded jails at both the County and State level. Counties are holding, and housing State inmates and the news today is that the State is sending up to 250 inmates to Texas. Inmates will be held at the Karnes County Correctional Center until the department can reach a long-term agreement with a bed provider somewhere out-of-state. Sending inmates out of state is expensive and Idaho needs to explore different means of housing inmates. More prisons? Lighter sentences? I would be interested in your thoughts. This week I also met with the Idaho Cattle Assn, the Nez Perce Tribe, Idaho Assn. of Realtors, Representatives from the Council of State Governments West, Idaho Economic Development Assn., Idaho Mining Assn., Idaho Assn. 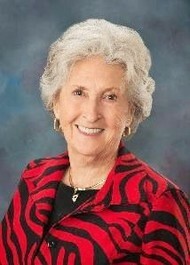 of Counties, AARP and the Coeur d’ Alene Tribe. Thank you for the honor to serve as your Dist. 25 Representative. 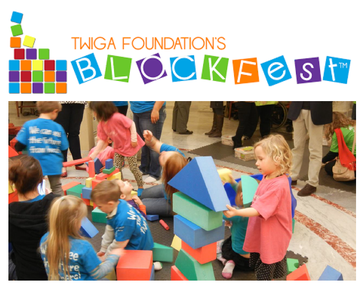 Young children, parents and teachers gathered in the rotunda this week and shared the interactive BLOCK Fest® program with legislators and the public. BLOCK Fest® was developed and piloted by the University of Idaho in 2005. It is a research-based program that helps raise awareness of early math and science learning by offering a hands-on block play experience for young children, parents, preschool teachers and the community. Click Here to learn more about the BLOCK Fest® program.